An interesting theme concerning Syria is the involvement of the People's Republic of China in the conflict. While China’s diplomatic and economic assistance has been constant, its military contribution to Syria is less known. It is important for China and Russia to contain and defeat the terrorist phenomenon in the Middle East, as well as to defang the strategists in the US deep state who are unceasing in their efforts to employ jihadism as a weapon to destabilize Eurasia’s integration projects. The Jihad International, under the economic and strategic guidance of the United States, has recruited tens of thousands of terrorists over the years and sent them to Syria. Among these, a significant number come from the Uighur ethnic group, situated in the autonomous Chinese province of Xinjiang, particularly from the city of Kashgar, geographically located in the extreme west and close to the borders of Kyrgyzstan and Tajikistan. The employment of ethnic and religious minorities to destabilize the majority of a given population has been an ancient artifice repeatedly relied upon by great powers. We thus remember how radical Islam was used in Chechnya to strike the Russian Federation at its "soft underbelly" in the south-west of the country. Two wars and repeated terrorist attacks show the area has yet to be fully pacified. The Wahhabis, a Sunni (anti-) Islamic minority, have shown themselves to be the perfect spark to ignite the tensions between Shiites and Sunnis in the Middle Eastern region and beyond. The case of the Uighur Islamist extremists in Xinjiang is no exception, and the Chinese central government is well aware of the potential danger from an internal uprising or targeted sabotage in the region. Not surprisingly, there has been a tightening of security measures in the region, with exercises against terrorist attacks and riots carried out by police and paramilitary groups. Beijing does not underestimate the danger posed by populations susceptible to foreign manipulation. While the economic support for Uyghur Islamist separatists more likely derives from Turkey than Saudi Arabia (for historical reasons), it is worth highlighting the highly proactive attitude of China in addressing the issue. As well as beefing up internal security and having a policy of zero tolerance towards such extremist ideologies, Beijing has since 2011 been contributing economically and diplomatically to the Syrian war against the jihadists. Official estimates place about 5,000 Chinese Uyghur terrorists in Syria, and Beijing’s strategy has reflected the one already implemented in the Russian Federation. Rather than waiting for highly trained killers to return home, it is better to confront the danger in a foreign land, thereby gaining a strategic and tactical advantage over those financing and manipulating terror, which is to say the American deep state and its military and security apparatus. Thus far, there has been a continuous support of the Syrian government coming from Beijing, both economic and diplomatic. 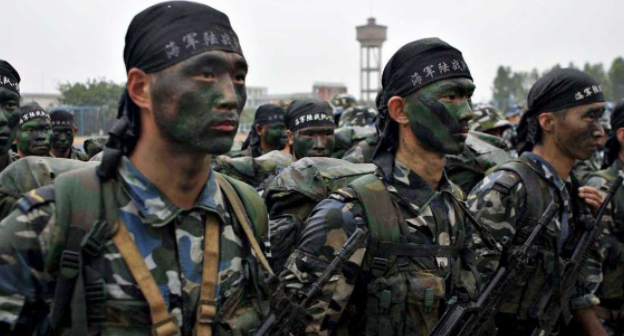 However, rumour over the last few weeks has it that Chinese special forces and war veterans will be deployed to Syria to eliminate the Islamist threat breathing down on China’s western border. As always, when Beijing decides to move, it does so under the radar, with extreme caution, especially militarily. Chinese military strategists intend not only to act pre-emptively against internal destabilization, but to also respond asymmetrically to American involvement in the South China Sea and other areas lying within the China’s sphere of influence. The insertion of Chinese troops into the Middle East (albeit in limited numbers) would signal an epochal change in the region, a change that was instigated by the Saudi-Israeli-American trio in an effort to employ controlled chaos through Islamist terrorism but which is proving to be a chaos that they are incapable of controlling. Preventing the spread of terrorism in Asia, and more generally in Eurasia, is understandably an important goal for Russia and China, especially in view of ambitious infrastructure projects like the Belt and Road Initiative (BRI). Much of the success of this project will depend on how well the Chinese government and its partners (Pakistan, Afghanistan and Turkey in particular) will be able to prevent destabilization through the fanning of ethnic and religious tensions along the route of the BRI, such as in Pakistan. China’s foray into Syria will involve a few special-forces units, namely: the Shenyang Military Region Special Forces Unit, known as the "Siberian Tigers"; and the Lanzhou Military Region Special Forces Unit, known as the "Night Tigers". These units will have responsibilities for advising, training and conducting reconnaissance. Similar to the Russian engagement in Syria, Chinese involvement will remain as hidden and limited as possible. The Chinese goal, unlike the Russian one, concerns the gaining of urban-warfare experience, in addition to hunting jihadists, and more generally, to test Chinese military readiness in war conditions, experience of which is lacking in Beijing's recent experience. China’s involvement in Syria is less obvious than that of the Russian Federation. The strategic objectives of the Chinese vary greatly from that of the Russians, especially vis-a-vis the Russian ability to project forces a long way from home. The Chinese and Russians are increasing their operational capabilities, both in terms of defending their territorial boundaries as well as in their ability to project their power as a result of increased naval and aerospace capabilities. Syria offers Beijing the perfect opportunity to include itself in the global fight against terrorism, thereby preventing possible terrorist insurgencies at home. Further, it serves to send a clear message to rivals like the United States who might have thoughts of using Islamic terrorists to destabilize China. Beijing is aware of the perverse employment of terrorism to advance geostrategic goals by its Western adversaries and has no intention of succumbing to waves of attacks or chaos coordinated by the Western powers. Prevention is better than cure, and Russia and China seem to have completely embraced this philosophy by deciding, in different ways, to assist allies like Syria, Egypt and Libya to fight terrorism. In terms of diplomacy and economic aid, the Sino-Russian contribution could prove decisive in linking the Middle East and North Africa to major projects under development, such as the BRI (Belt and Road Initiative) and the Eurasian Union. We are still at the preliminary stage for the time being, even as 2018 could end up being the year that major conflicts in the Middle East and North Africa (MENA) region end, with the prospect of economic reconstruction being at the forefront.